As a 2018 Nissan Global Award winner, Trophy Nissan is proud to be the #1 volume Nissan Dealer in Texas and the #1 volume Certified Nissan Dealer in the Nation. We look forward to providing you with a truly exceptional experience. Here at Trophy Nissan, it is our mission to be the automotive home of drivers in the Mesquite, TX area. We provide a vast selection of new and used vehicles, exceptional car care and customer service with a smile! Speaking of new Nissan models, you have your pick of our showroom. Our local dealership keeps a great stock of used cars, trucks, and SUVs in inventory. With competitive prices offered on every pre-owned model for sale on our lot, you won't find a reason to visit any other dealership in Mesquite. When it comes to financing, that's where our car loan and Nissan specialists step in. We're here to help you by going over every option clearly, and will work hard to find the right plan for you. Whether adding accessories or protection packages, or figuring out the final details of your loan or lease package, let us guide you along the way. Trophy Nissan is also by your side whenever you need any car service and repair work done in Mesquite. What's more, our auto parts team would be happy to get you whatever you need to keep your Nissan vehicle on the road for many miles to come. 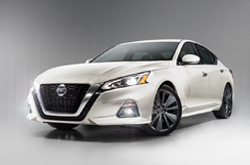 Stop by today to browse new Nissan cars in Mesquite, including top picks like the new 2019 Altima, Sentra and Maxima! Trophy Nissan is also your destination for Nissan's many advertised Sales Events, where you'll find outstanding offers on new Nissan cars. As one of the largest and best-reviewed Mesquite Nissan dealers, we're proud to offer one of the finest selections of inventory in the city, with some of the most aggressive prices that you'll find anywhere in town. Even Southern Oklahoma Nissan shoppers come to us to find cars! Looking for a top-notch car dealership near me? Come see us! We offer high-quality car services and a wide selection of new Nissan cars and used cars for sale in Mesquite. Get detailed directions and our store hours here. Whether you live in Denton, McKinney, Grapevine or anywhere in North Texas, if you're shopping for Certified Pre-Owned or used Nissan cars in Mesquite and Dallas, it is worth making a quick trip to Trophy. Head to 5031 N. Galloway Avenue any time between 8 a.m. and 10 p.m. Monday through Saturday to browse our collection of Certified used Nissan Altimas, Certified used Nissan Sentras and Certified used Nissan Quests, along with other hot models like the Xterra, Rogue and even, on occasion, the legendary 350Z. Our Mesquite Nissan dealership also has a wide selection of imports and domestic vehicles from other manufacturers. If your local Dallas Nissan dealer doesn't have what you're looking for, head our way to check out a great selection of well-maintained and low-priced used cars today! Keep it original and keep it real with genuine factory parts and accessories! Looking for Nissan OEM parts in Dallas, Denton or Fort Worth? Trophy's knowledgeable staff can assist you in finding the right part or hard-to-find accessories through our national Nissan OEM Part Center. The products offered are not only top-quality, but also affordably priced, and you'll even find authentic NISMO components that are built to last! Thoroughly engineered and rigorously tested to ensure a seamless fit and outstanding performance, every NISMO part and accessory is designed and crafted to meet Nissan standards. Our NISMO parts are also backed by Nissan's 3-year/36,000-mile Parts and Accessories limited warranty when installed at the time of your purchase. If you're in search of auto repair near Dallas or Mesquite, look no further than Trophy. Nissan parts and accessories deliver the fit, reliability and performance of your car's original hardware, and when installed at our Mesquite auto repair shop, they're covered by your warranty and you can be confident in the workmanship that your car receives. Our professional and OEM factory-trained technicians and mechanics can quickly diagnose, service and repair any Nissan to factory standards. Trophy Nissan has invested in the latest diagnostic equipment and information software to ensure that your car is repaired right the first time. Our Nissan dealership in Mesquite also offers auto repair coupons for a wide range of services, including oil changes, brake replacement, car detailing, tire alignment, air filter replacement and much more. Need a car loan in Dallas or Mesquite, Texas? If you're not happy with the offers you've received at your local Nissan dealer in Dallas, visit us to see if our experts can help you! With experience in securing both low-rate and long-term loans and leases, our financial representatives can help you access a financing package that suits your specific needs. We work with many local and national car credit lenders to help those who have credit issues resolve and re-establish a good credit rating via an auto loan. Stop in today and let's discuss your options!